Why do we cook? Ostensibly because we need to eat to stay alive, but I think for many it goes deeper than that. We cook to show we love someone. We cook because we want to create and experiment. We cook to nurture, to heal. There's something innately comforting about the act of cooking, all attention diverted towards slicing, stirring, tasting. I like to think you can taste the difference when something has been cooked with love. When time calls for comfort food - soft, delicious, easy to eat - for me there is nothing better than a good bowl of pasta. Dressed down and smothered in gooey, melted cheese it's a reassuring comfort blanket, but importantly it also scrubs up pretty well and is an altogether different beast. This is somewhere between the two. Delicious and a little creamy but fancy enough to impress friends for a weeknight supper. It's also quick and easy enough to make when you need the edible equivalent of a hug as it's on the table in 35 minutes at most. Best made with a glass of wine in hand and great company, as this is made with comparatively few ingredients it helps if you use the best you can get your paws on. 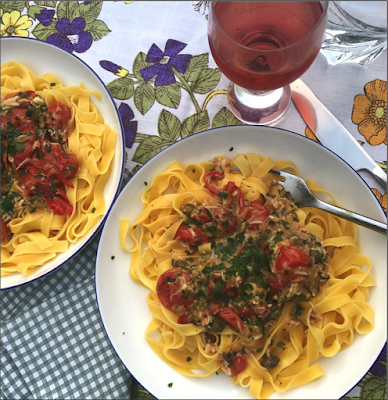 Full-flavoured tomatoes will really bring it to life, and try to get your hands on good quality egg pasta (I used tagliatelle from Rummo). Better still, go the whole hog and make it yourself! Place the vine tomatoes on a baking tray and drizzle with 1tbsp olive oil and a little salt and pepper. Roast in the oven for 20-30 minutes, until the skins start to split and the tomatoes are soft. While the tomatoes are roasting, finely slice the chilli, garlic and spring onion, then gently heat a large frying pan or sauté. With the remaining olive oil, melt the anchovies with the red chilli for about 5 mins, then add the garlic and spring onion. Cook for a further minute, then add the capers and turn the heat down as low as it will go. Once the tomatoes are roasted, add to the pan minus their vines and smoosh them down a little so they spill their gorgeous juices. I also added the olive oil from the roasting dish as it had been infused with tomatoes juices as they roasted. Add the wine, bring to the boil then reduce the heat and stir in the crab meat. The brown meat means it will take on a lovely, creamy consistency. Season to taste with salt and pepper, and your sauce is pretty much ready to go. Add the tagliatelle to the boiling water, and cook as per the instructions. Stir the parsley into the sauce and add a squeeze of lemon. I also chucked about a tablespoon of the pasta water into the crab sauce to thin it a bit. Drain the pasta, then divide up between the plates. Serve with an extra sprinkle of parsley, a glass of chilled wine and good company.